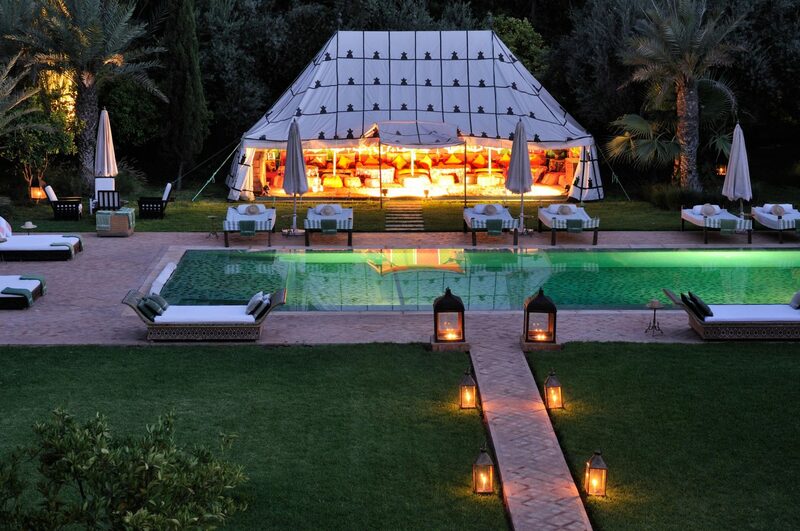 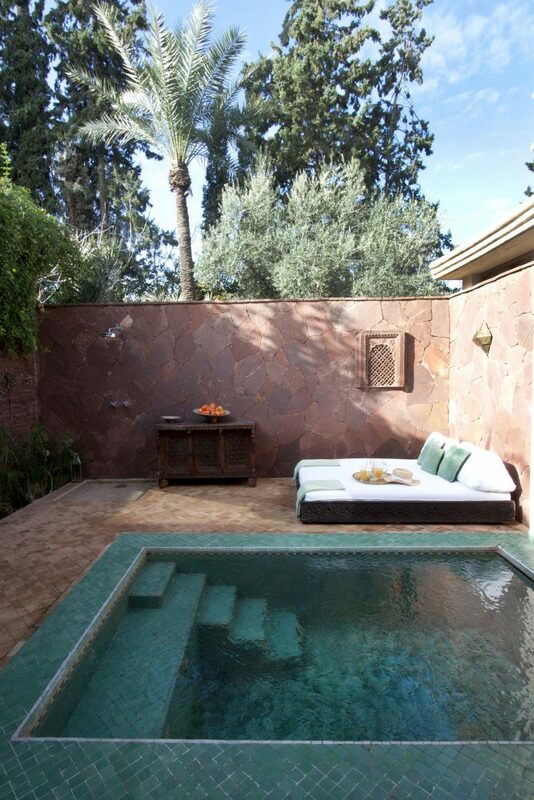 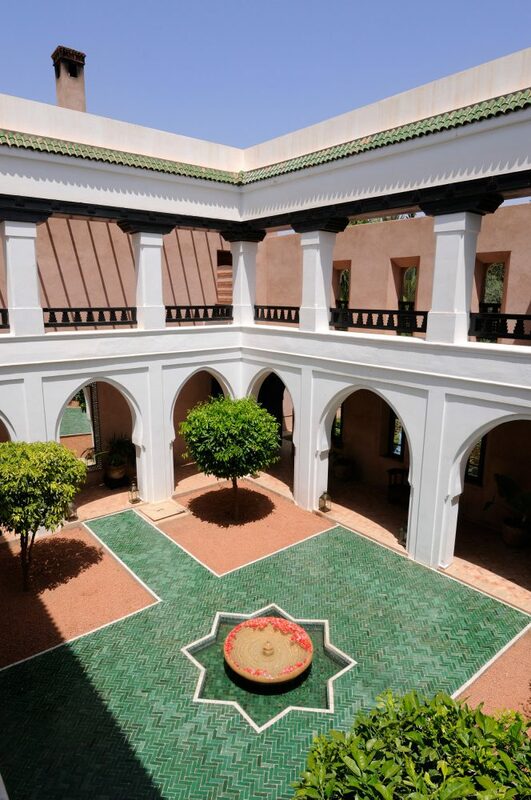 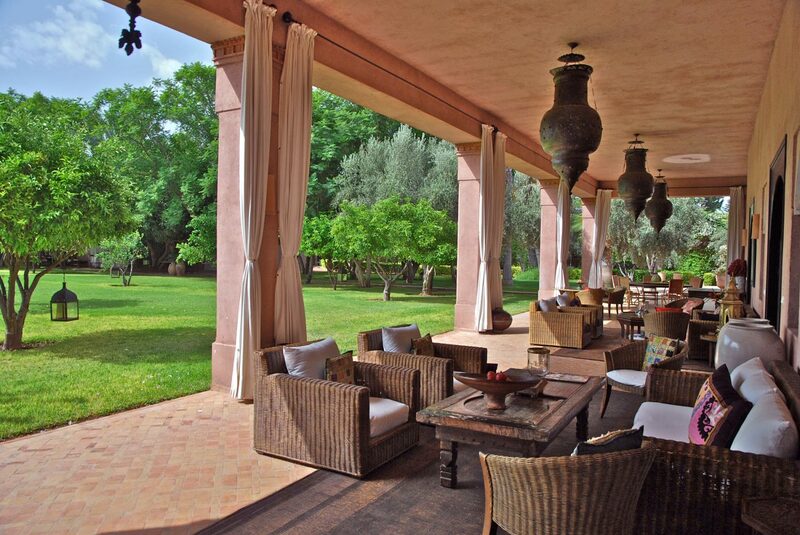 The location of the villa provides tranquility away from the hustle and bustle of Marrakech, just 15 minutes away. 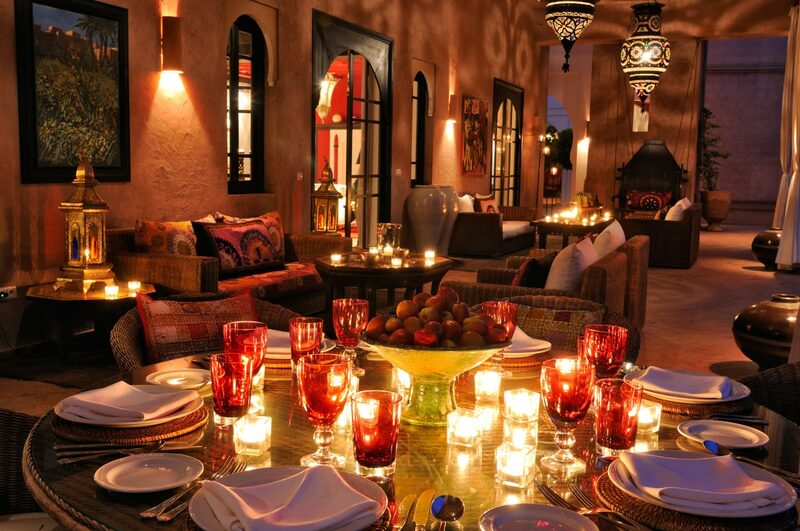 Don’t miss a visit to the legendary Djemaa-el-Fna Square with its lively performers and souks. 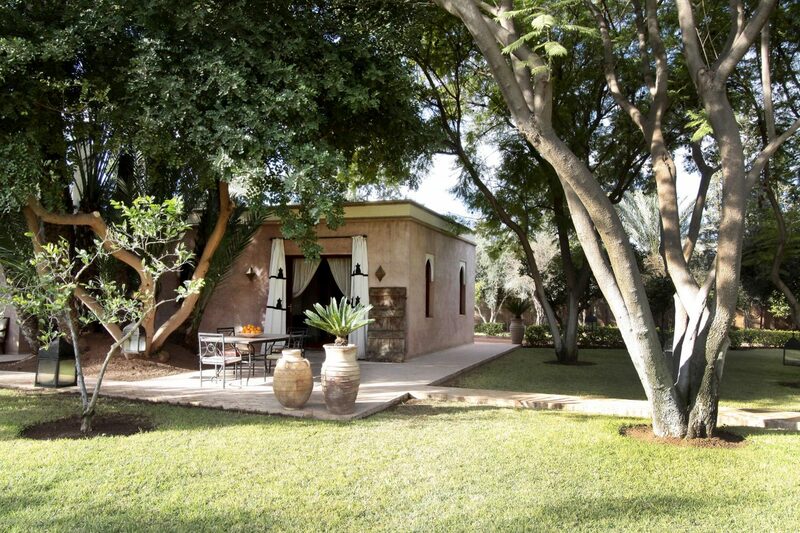 Activities close to the house, include horse riding, camel riding, go-karting and golf. 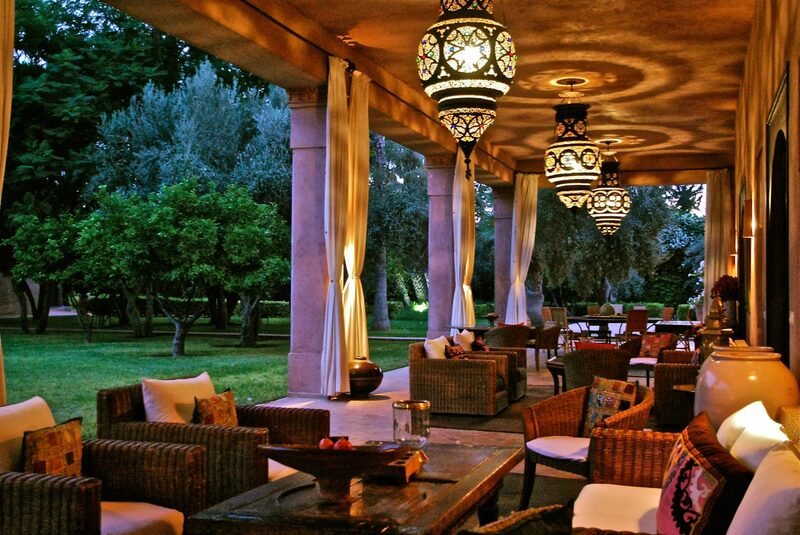 Guides can be arranged for those who wish to explore the centre of Marrakech. 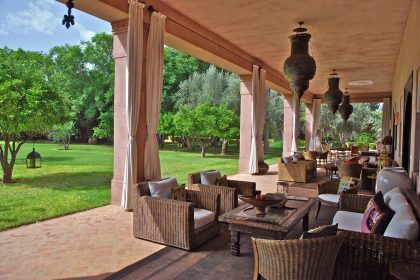 Take a trip into the high Atlas Mountains, where there are endless opportunities for walks and trekking. 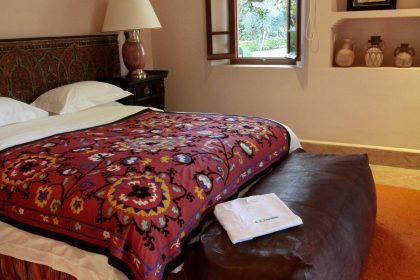 Trips can be arranged by the house, including a one or two hour donkey trek and a country lunch, you could even do an overnight bivouac stay. 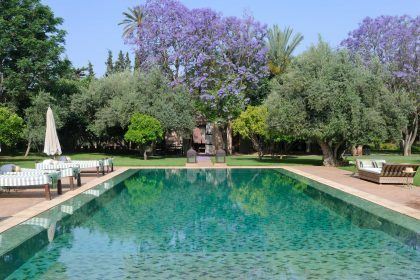 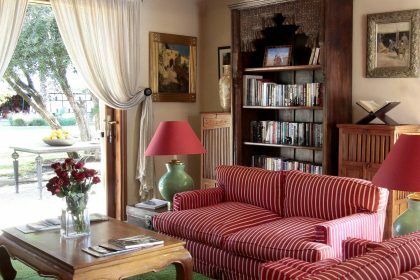 This beautiful villa is set in a private estate and set in vast gardens filled with lavender, orange blossom, bougainvillea and olive trees. 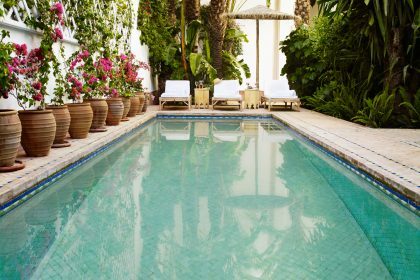 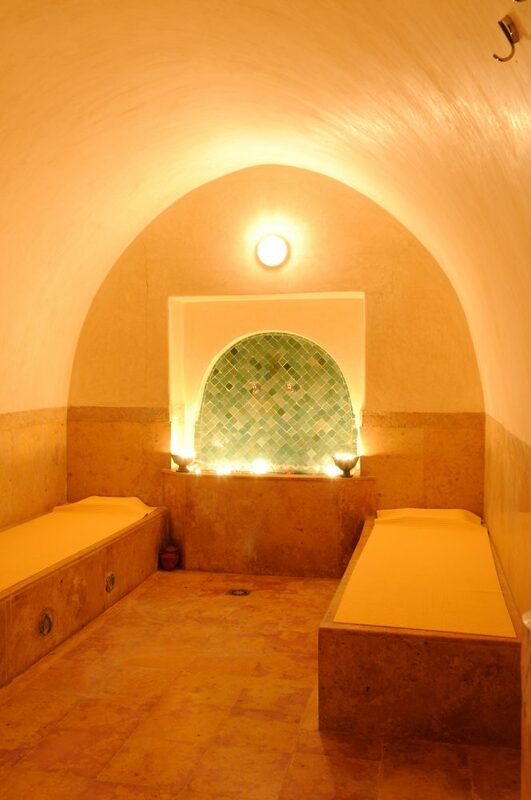 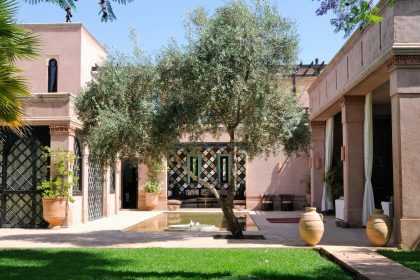 Who could believe you’re just a 15 minute drive to the hustle and bustle of Marrakech’s souk? 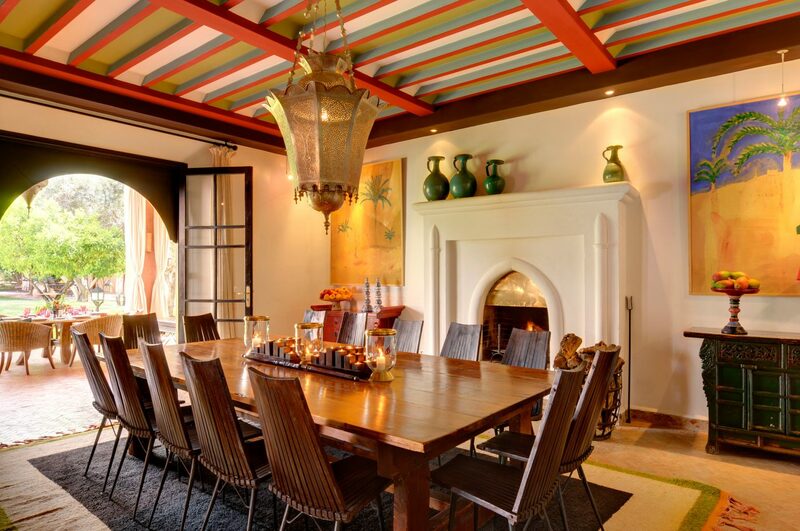 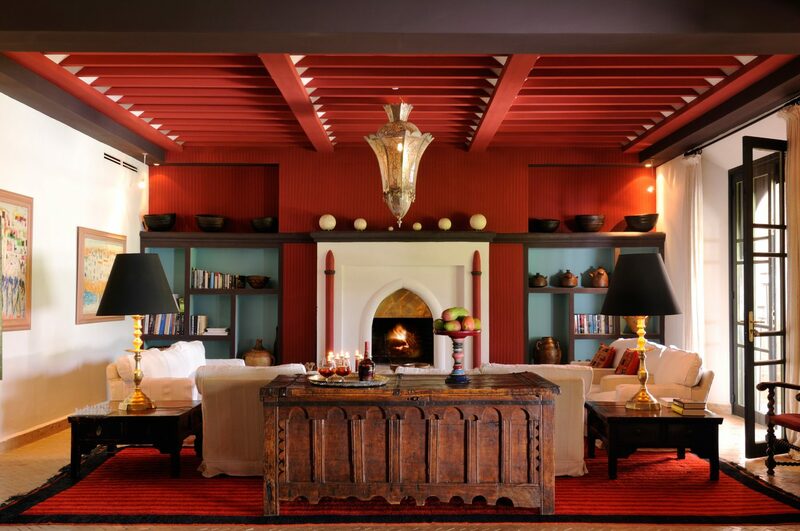 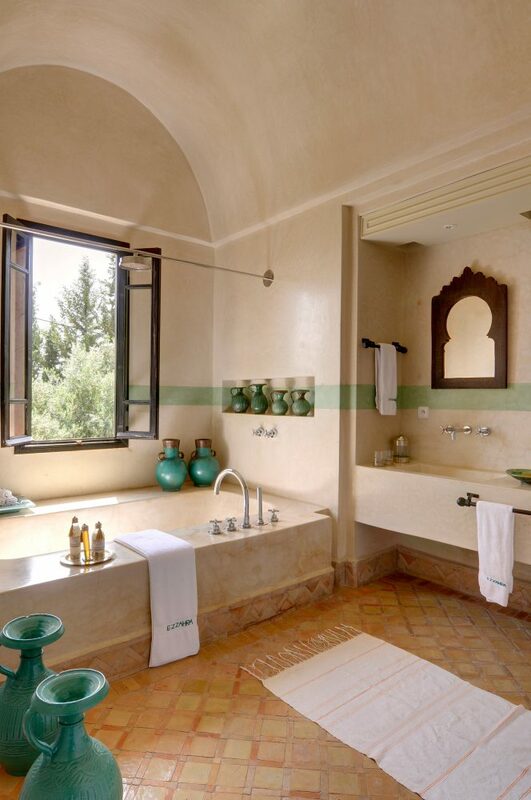 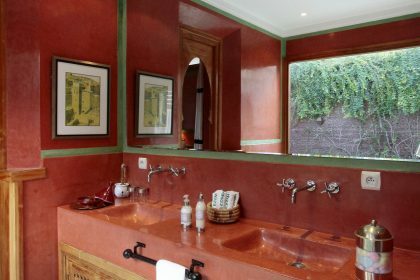 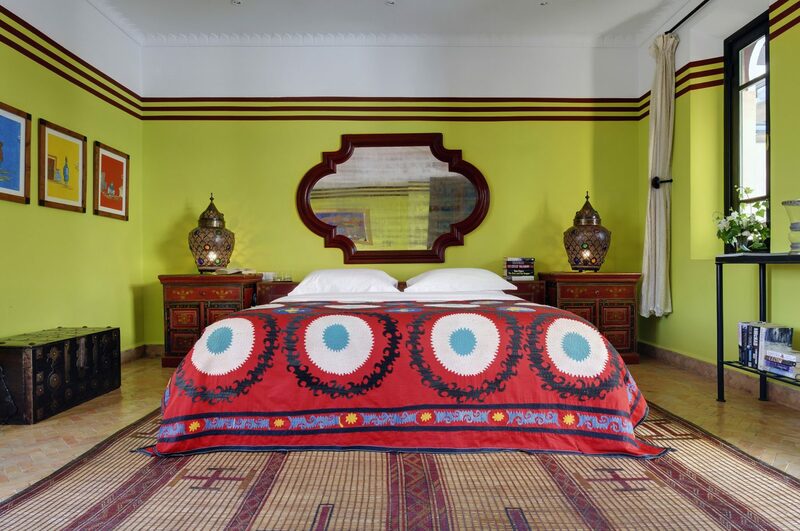 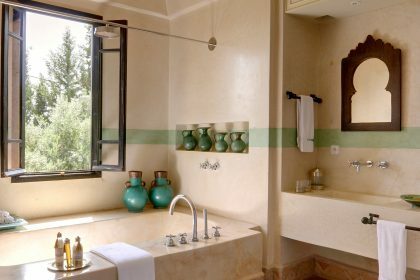 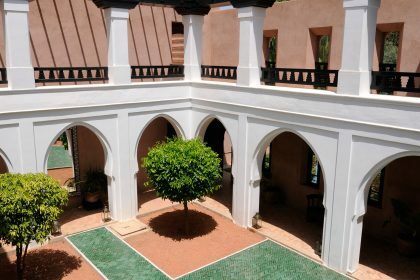 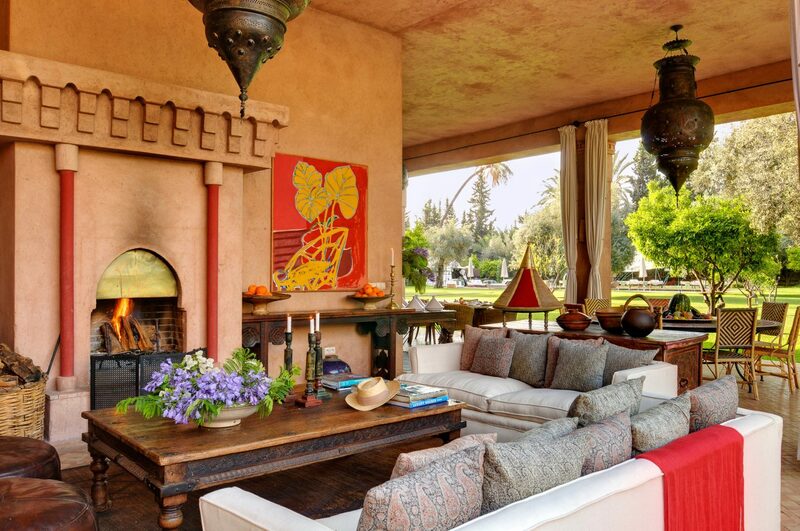 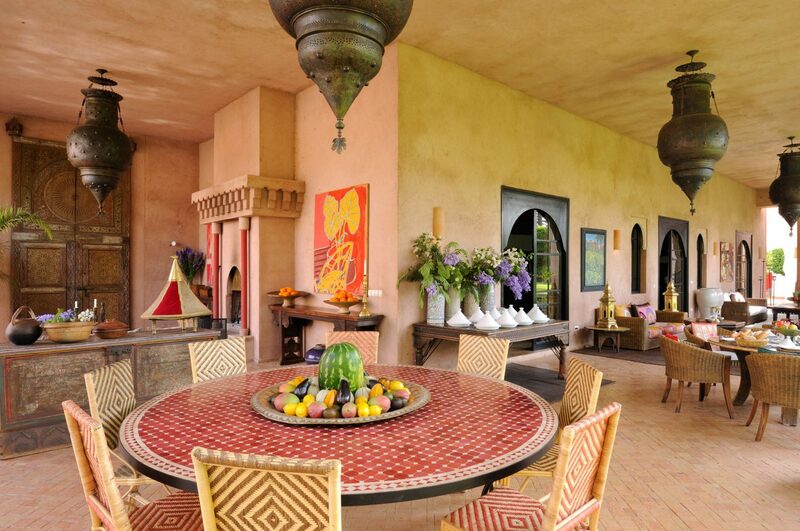 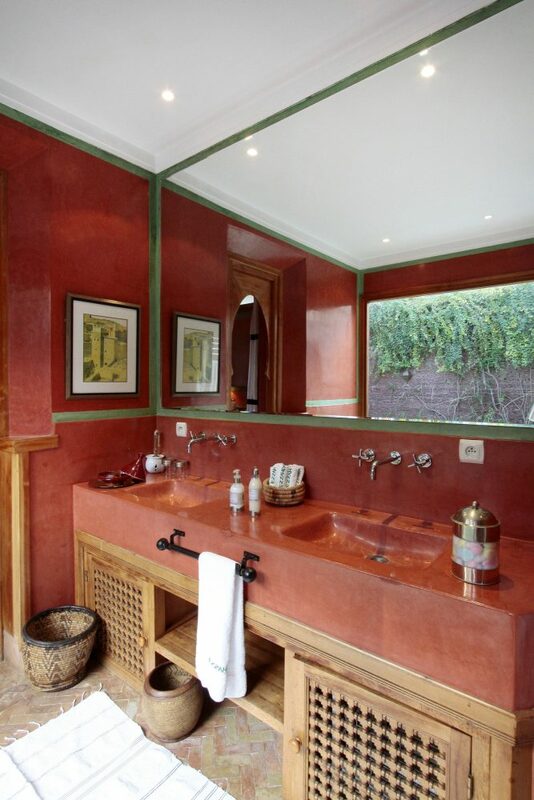 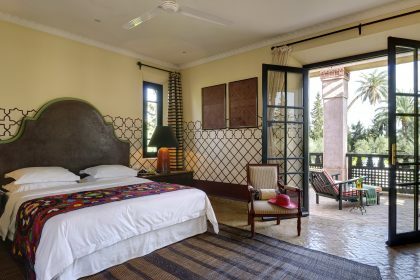 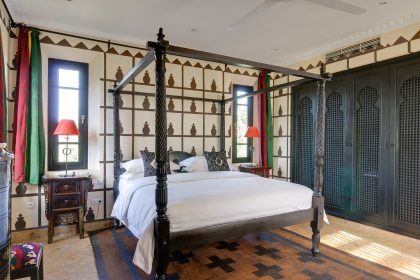 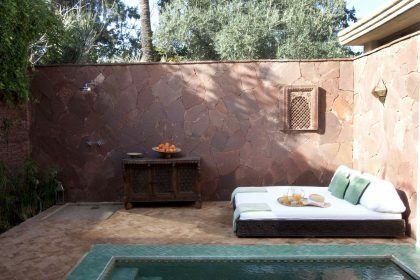 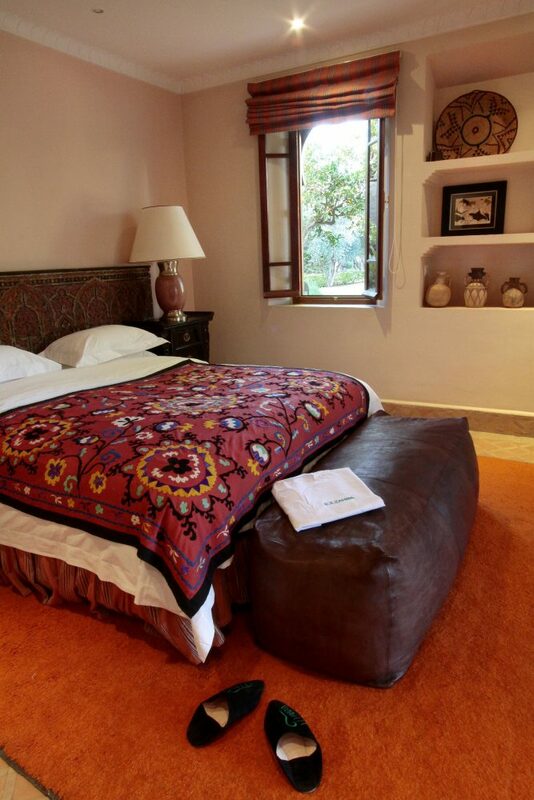 The interiors have a contemporary Moroccan feel, designed by Philip Hooper who has hand selected many souk finds including Berber benches, wooden carved doors, antique pots and Beni Ourain rugs. 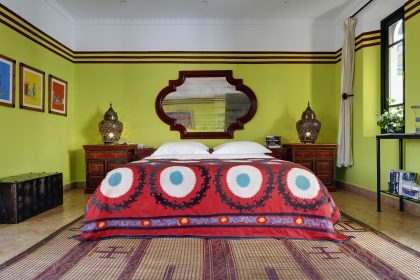 The bedrooms are, quite simply, beautiful, the designer has used strong colours, vivid walls, bed covers and cushions make each room unique and memorable. 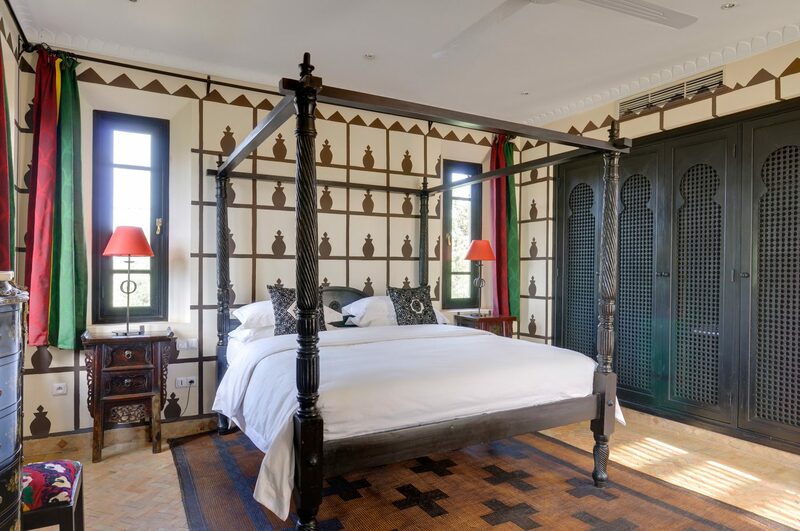 Floors are inlaid wood or tile – again, each room is different. 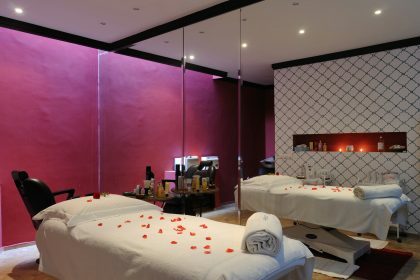 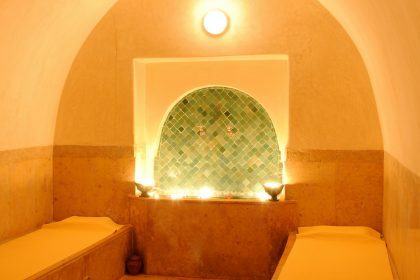 There is a fabulous spa and treatments galore! 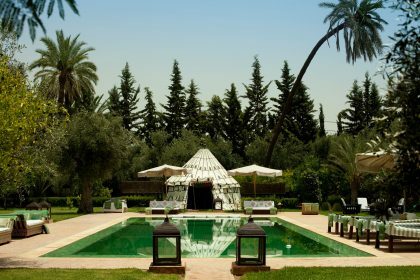 The vast swimming pool is surrounded by grass and sumptuous sun beds – there’s a beautiful tent at one end for additional shade and seating. Eating outside is a must and there are several different places where you can enjoy an al fresco experience. The long, wide terrace off the front of the house has low seating and big tables – great for playing cards after supper, or just somewhere to rest a cold drink. 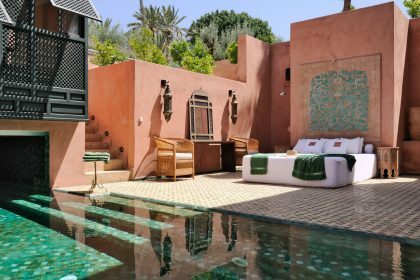 If you fancy an evening shopping or eating out in Marrakech, a tour of the souks and Jemma el-Fnna which is included, will help you get your bearings. If you’d rather eat in there’s a cook who will do that for you – so you really don’t have to think at all… just come here and enjoy the rest and relaxation. 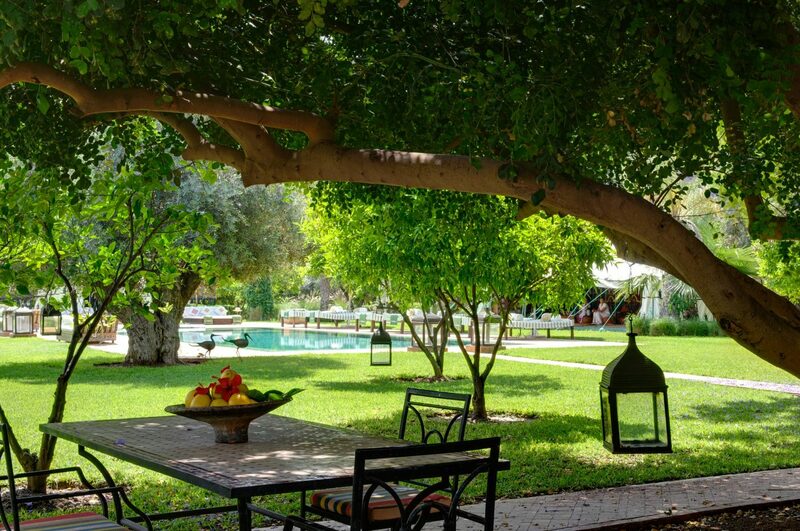 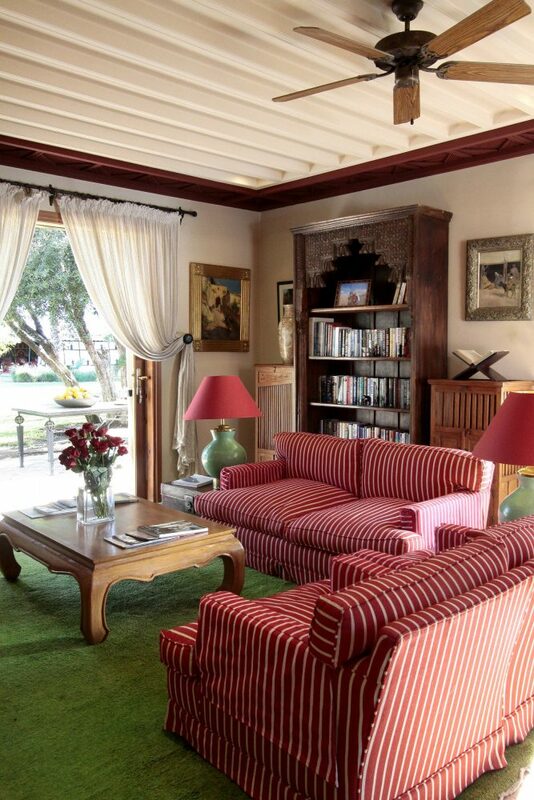 The complete estate covers 20,000sqm with ancient olive trees, date palms and orange and pomegranate trees. There are 2 other houses on the estate, which can’t be seen, but can be rented together if you want to bring multiple families together or are planning a big celebration.